I have been on a bit of a DIY craft kick lately (so much so that I’m even taking a class on Monday nights at the Cambridge Center for Adult Education). Pinterest is a craft-lover’s dream, and while looking up creative jewelry displays awhile back I stumbled upon a DIY bracelet holder using glass bottles. Initially I had been looking for displays for when I theoretically decide to sell at craft fairs. But I thought this would also be great for home, especially since my bracelets always seem to be buried in various boxes and I never know what I have. I decided to make my own version of this for home, and after a recent holiday meal I found myself with several wine bottles. I wanted to spray paint mine, and I was so excited when I found stone-textured spray paint (what will they think of next?!). I happened to purchase Krylon Make it Stone!® Textured Paints in Charcoal Sand and Obsidian. A few layers of pain later and voila! 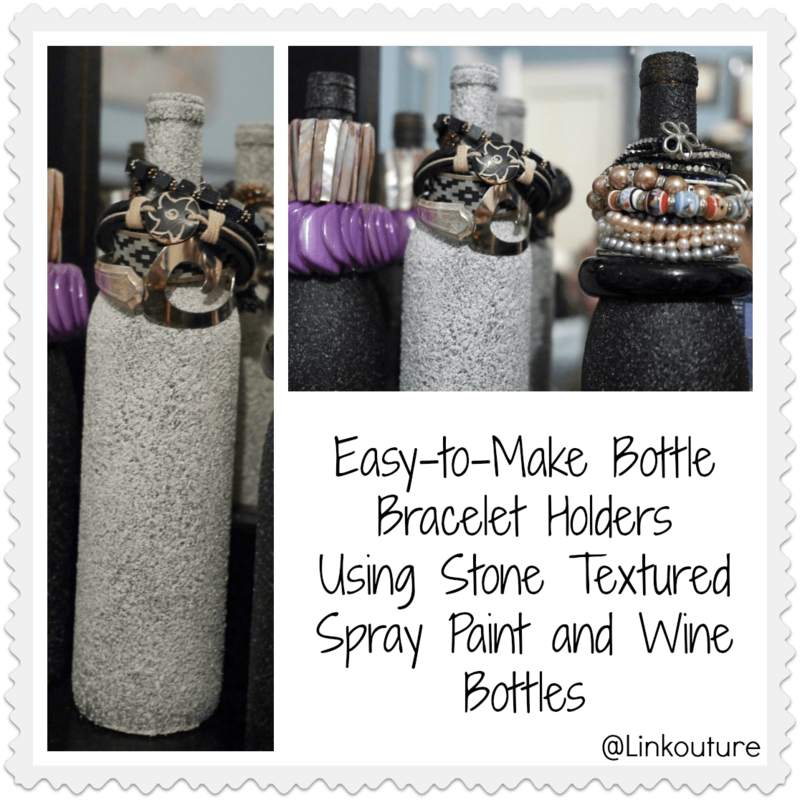 Now I can see all of my bracelets in a pretty, inexpensive (depending on your taste in wine) bracelet display. To get the labels off the bottles, I soak them in hot, soapy water. Most labels tend to peal right off after soaking them for awhile. Some adhesive leaves a bit of a residue, but I was able to wipe it off with a sponge. I found I only needed 2-3 layers of the darker spray paint, but I needed a couple extra layers of the lighter one. For my next project, I will be using the paint & a picture frame to make an earring display.